If Music be the Food of Love, Play On: Winter Bites Ottawa - Why On Earth Would I Do It? Winter Bites Ottawa - Why On Earth Would I Do It? 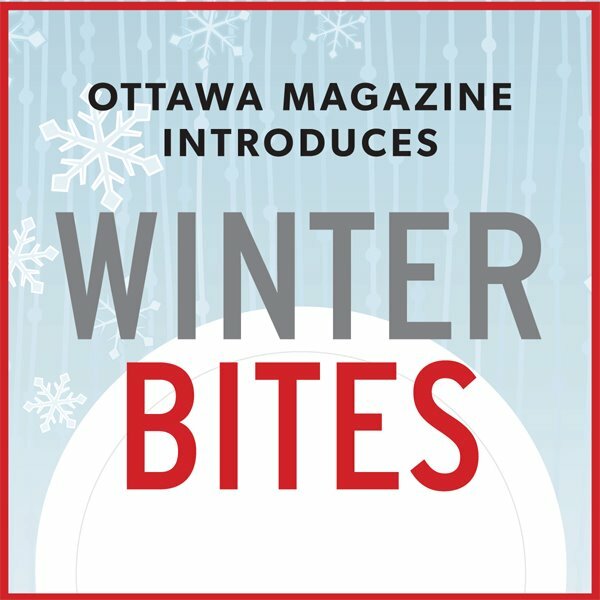 Ottawa Magazine has teamed with local restaurants in the deep of winter to promote their good eats by offering 3-course prix fixe menus for lunch and dinner (some establishments are only doing dinner). The promotional period runs from Thursday, January 12th through to the 28th. Typically there is a lunch choice of either $15 or $20. And dinner choices are $30 and $40. I have been tracking this event out of the corner of my eye since it was first announced at the end of October. At first, I was quite 'beige' to the idea. Always weighing the value proposition, I needed content to get me to commit. That crisp, fresh, snappy blue, white, grey and red logo kept me watching as new news rolled in. Eventually the list grew and the tweets began to stream. Winter Bites is now up to 29 participating restaurants. By contrast, Toronto's Winterlicious event started with 36 restaurants in their first year a decade ago. They are approaching their 10th year as Winterlicious kicks off at the end of the month. They are now up to a whopping 175 participating restaurants. By that measure, Ottawa's first year of Winter Bites appears to be a success. So why on earth would I do it? Why would you do it? Who eats out in January? Maybe you, like me, missed out on seeing a number of good friends over the busy month of December. I personally am taking time in January to catch up. If guests are coming to town to enjoy all that winter in Ottawa has to offer, some are picking January over February to avoid the big Winterlude crowds. Or as some affectionately call it, 'Waterlude'. Ottawa has seen its fair share of mild Februarys. Here is a chance to try out some restaurants on the hesitation list - hesitation because of what I may have heard; a prior 'meh' experience but think they deserve a second chance; just don't know that much about them; it feels like it's too far to travel. A prix fixe menu says 'deal' and in some small way minimizes the risk of taking a chance. For those pushing their Christmas parties into January because December's dance card was too full, it will be a way to take on an event at a great price. I never warmed to the Groupon concept. I want to pay a fair price for what I receive. Groupon deals make me feel like all the risk is being born by the restaurant. I want to support local and I want to see these businesses thrive. They can't give their food away for 'free'. A prix fixe menu event like Winter Bites seems like a great way to court potential new customers where both sides can win. Many of us cocoon in January solely because of the weather. With these constant mild spells, I want to be outside, not in. Let's hope this keeps up from the 12th to the 28th. The price point for Winter Bites is much lower than many choices with Taste of Winterlude, another fine food event starting at the end of the month. There are plenty of people wanting to watch their dollar but also enjoy Ottawa's eating scene. Nice to have something for everyone. So what do I need to actually commit and make plans? Secondly, I need to see menus. If I am jumping into this event, I want to be lured in. Tell me what you are going to offer for lunch and dinner. If it's a lunch date I am on and you are just participating in the evening, I will be taking a pass on you. BTW, my preference is for lunch dates. I crave daylight! Naturally, I have seen a lot of repetition on the menus so far, as 'winter fare' is popular now. And that's okay. It gives it all a competitive feel. Perhaps a chance to crown the best crème brûlée in town. Probably the easiest way to peruse the many menus is to go to the Winter Bites Facebook page and cruise through the images in their wall photo library. This has been so helpful for me to start my Winter Bites battle plan. 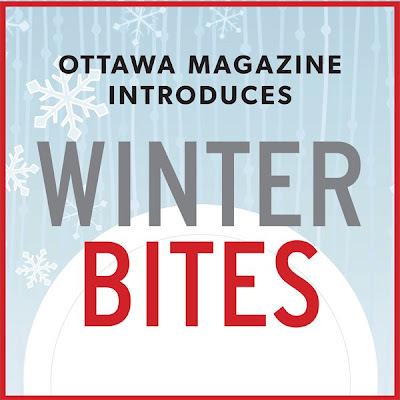 Winter Bites is here to take a bite out of Ottawa's winter. Are you making plans to be a part of it? I would love to hear your picks and why! Torviewtoronto: If you ever get up to Ottawa, I hope you will have a chance to enjoy the good food scene.